Songs of Eretz Poetry Review is pleased to present “Cave Painter” by James Frederick William Rowe, Frequent Contributor and this week’s Poet of the Week. 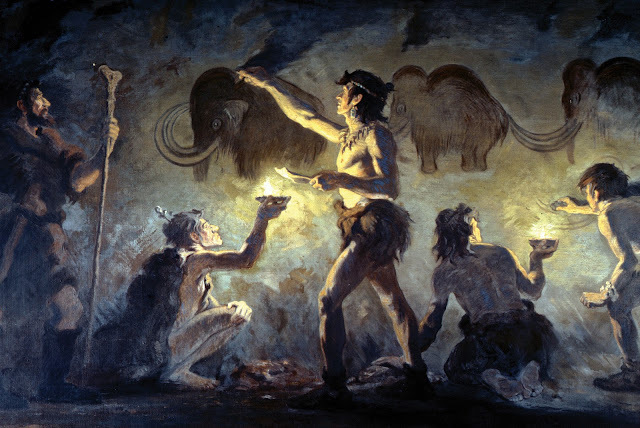 "Cave Painter" is the second in Rowe's "Caveman Trilogy." The first poem appeared in the Review yesterday, and the third poem will appear in the Review tomorrow. A biography of the poet may be found in our “About Our Editor & Frequent Contributors” section. Or am I the one trapped? For all ages, for all time! Poet’s Notes: This poem is part two of my "Caveman Trilogy" and takes as its inspiration the abundance of cave paintings found scattered across primeval human settlement. I have turned the original cave painter into a sort of priestly-ecstatic figure, who at night begins to paint the images of his "waking dreams" upon the walls as the rest of the cave sleeps. He is "possessed" by the inspiration—the spirits of the fire and shadow working upon him—that the world he knows—perhaps recognizing, presciently, that one day man will not live as he did—should be "preserved for all ages, for all time". It is notable that he characterizes his thoughts as both "true and false", indicating that these are as much fantasies as depiction of reality, indicative of the mystical character of the whole procedure. I begin each stanza (excluding the first) with "and". This gives a sense of enjambment that I thought suited the ecstatic character of the painter. As the poem progresses, the setting transitions to a focus on the painting, and then to the painter's mission, ending with the recognition that the painter is marking his own existence as much as those of the images. Though the cave painter is anonymous both in reality and in the poem, he is nevertheless remembered by the work he left behind. He has "stole(n) life from time". The ending of the poem required some attention after I had a degree of difficulty completing it after the initial spark of inspiration ceased working on me. So it was that my subway poem was completed at home, after some deliberation and thought. Nevertheless, it wasn't a difficult poem to write, and came rather naturally.